Former President Goodluck Jonathan, on Monday, in Abuja, began a subtle move to douse tension generated among members of the Peoples Democratic Party over the outcome of last Saturday’s national convention in Abuja. The former President assembled a team of his loyalists, who it was gathered, would visit aggrieved aspirants with a view to appealling to them to forget about their grievances and work with the Uche Secondus-led members of the National Working Committee. Though the party has a standing committee on reconciliation, headed by the Governor of Bayelsa State, Seriake Dickson, it was gathered that the former President decided to assemble his team as the Leader of the party. Among those in Jonathan’s team are his former Minister of Special Duties, Tanimu Turaki (SAN); a former Minister of State for Finance, Amb. Bashir Yuguda; a former Minister of Finance, Nanadi Usman; and his (Jonathan’s) bosom friend, King Turner. Jonathan, on Monday, led his team to the house of a former Minister of National Planning, Prof. Suleiman Abubakar, in Abuja. Those in his entourage were Turaki and Turner. The visit, which was described as unscheduled, was said to have taken Suleiman by surprise as he was said not to have been informed that the former President was visiting. Suleiman had threatened to challenge the outcome of the convention in court, saying his name was technically omitted among those contesting the position of the National Publicity Secretary. He had told The PUNCH on Sunday that he would go to court to challenge the outcome of the election into the position he wanted to occupy. A source at the meeting said the former President asked him to sheathe his sword and let bygones be bygones. The source added, “Jonathan appealed for restraint. He thanked the candidate for his doggedness and passion for the party and pleaded with him to accept the outcome of the election as the wish of God. “Jonathan was full of praises for Sulaiman, who he admitted apparently remains the most qualified person for the job. Confirming the visit, Suleiman said he thanked the former President and promised not to go to court. Meanwhile, Secondus has appealed to all those that contested and lost at the convention not to feel bad, saying there was no victor and no vanquished. He spoke at the national headquarters of the party in Abuja on Monday when he and members of the NWC assumed office. The new party chairman promised to bring everyone on board in the running of the party. He stated, “By the special grace of God, elections have come and gone and I declare to you that there is no victor, no vanquished. “We promise to rebuild the party to regain the lost grounds. That will start today. “As I walked in through the gate, it was symbolic. I asked that the gate be thrown open. He added that he would decentralise power from the centre so that he and members of the NWC would be less busy to enable them (NWC members) to focus on the mission to reclaim power in 2019. He told the gathering, which included all members of the former National Caretaker Committee, led by Senator Ahmed Makarfi, that the old order was gone. Secondus commended Makarfi for holding what he described as the best national convention in the history of political parties in the country. In his remarks, Makarfi said it was wrong to assume that a section of the country had lost out in the party. He said there was no way the party would alienate any section, appealing to the new leaders of the party to embark on a process that he said would heal the wounds. Meanwhile, Governor Nyesom Wike of Rivers State and Uche Secondus, on Sunday night, met with a former Deputy National Chairman of the PDP, Chief Bode George, The PUNCH has learnt. It was learnt that the governor and the PDP chairman visited George at his Maitama home, Abuja, to seek his cooperation following the rancour that followed the PDP convention that held last Saturday, where Secondus emerged as the new party chairman. It was learnt that George told Wike to apologise to the Yoruba for his comments last Friday, arguing that refusing to do so would make it very difficult for them to campaign in Yorubaland in 2019. George, who was one of the chairmanship aspirants, had stepped down less than 24 hours to the convention, describing the event as a charade. He had also lambasted the Rivers State governor for saying the people of the South-West did not deserve to produce the chairman of the party. An impeccable source told The PUNCH that Secondus told George that he would work with everyone and nobody would feel marginalised in the party. The source added, “Governor Wike and Prince Secondus visited Chief George late on Sunday as part of efforts to reconcile aggrieved parties in the PDP. Prince Secondus asked George not to feel aggrieved as everything was mere politics and they should not lose sight of the most important thing, which is to unseat the All Progressives Congress. “Chief George received them warmly and advised them. He criticised Wike for making such disparaging comments about the Yoruba. Wike said he was sorry if anyone felt slighted but he meant no harm. “Chief George told him to find a way of assuaging the Yoruba who feel very bad with the way they have been treated. He told Wike that the APC is already exploiting the Yoruba issue and that if it is not addressed properly, it could affect the PDP’s electoral chances in the South-West in 2019. It was learnt that a former Deputy Speaker of the House of Representatives and former Governor Olusegun Mimiko also visited George over the issue and asked him to let bygones be bygones. Wike had, during a programme on Channels Television, titled ‘Sunrise Daily’, on Friday, said the South-West PDP lacked leaders that could head the party. The governor had said, “The problem that the PDP has today arose from the South-West. Look at the crisis! Mention one chairman that you will vote today in the South-West that will stabilise the party. Take for example, Tunde Adeniran. If you vote him in, then that will be the beginning of the crisis of the PDP in Ekiti State. “This is because he cannot cooperate with the governor. Our experience has always been that if you vote in a chairman from a state that has a (PDP) governor and they don’t work together, then that party will be in trouble in that state. Wike said even when Chief Olusegun Obasanjo was President, the South-West still did not vote for the PDP. He, therefore, stated that it would be unwise to concede the chairmanship position to the South-West in order to woo the zone. Secondus confirmed the meeting with George in an interview with one of our correspondents on Monday, stating that the former deputy national chairman of the party remained his boss. “Yes, we met. Chief Bode George remains my boss and I will always cherish him. I have tremendous respect for him and I will need him in the task ahead,” he added. Efforts to reach the Rivers State governor to confirm if he visited George on Sunday proved futile. But the Rivers State Publicity Secretary of the PDP, Mr. Samuel Nwanosike, said though he was not aware if Wike visited George, it was not impossible for the governor to reach out to the party chieftain. He described the governor as a peace-loving man who wanted the party to be more united in no distant time. 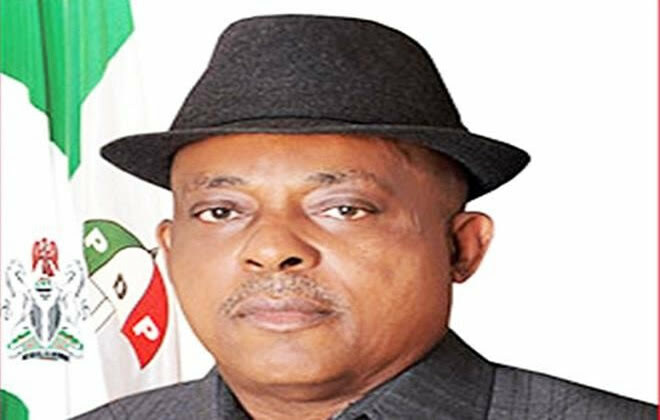 In a related development, the Minority Leader of the House of Representatives, Leo Ogor, on Monday, said the choice of Secondus as the new National Chairman of the PDP would propel the party to victory in the 2019 general election. Ogor noted that Secondus deserved to presently lead the party to overcome its 2015 failure, urging him to unite warring factions in the party for future elections. The lawmaker in a statement by his Press Secretary, Akpodhoma Michael, congratulated the PDP chairman and other new national executive members on their victory during the Saturday convention. The member, representing Isoko Federal Constituency, appealed to former chieftains of the party, who left due to the crisis in the party, to return home as the party under Secondus would provide a level playing field for all members ahead of 2019. Ogor added, “I am confident that the trust placed in you by the delegates of our great party will inspire you to continue important efforts in promoting the unity of our party, leading it on the path of prosperity, further well-being and success for our people during the 2019 general election. He lauded the efforts of Makarfi, who headed the National Caretaker Committee of the party, for leading the party out of its turbulent times. The Reps minority leader also commended the Delta State Governor, Dr. Ifeanyi Okowa-led National Convention Planning Committee for organising a transparent, successful and hitch-free convention. Also, the Chairman of Niger State Chapter of the PDP, Tanko Beji, on Monday, said last Saturday’s election of Secondus, as the new national chairman of the party, marked the beginning of a new dawn for the party. These were contained in a message the party sent to the new PDP chairman and other members of the new NWC. In the message by Beji, a copy of which was made available to journalists in Minna, the party said it was confident that the national chairman would bring about progress and unity in the party. He stated, “There is no doubt that your overwhelming victory with 2,000 votes, out of a total of 2,396 delegates at the convention, was a testimony to your acceptability by all delegates at the convention and the PDP members at home and in the Diaspora. “Your victory is also an endorsement of your leadership capability and belief that you possess all that it takes to move our party to greater heights. He advised the new national chairman to be wary of sycophants who could derail his plans for the party. “Now that the national convention is over, the new leadership should use the new spirit in the party to start the preparations for the next general election,” Beji added.